The following article originally appeared in Plumbing Contractor Magazine, November 2015. Download original article (PDF/2.3MB). St. Elizabeth Villa in Hamilton, Ontario proudly offers “care-free independent and assisted living” for up to 90 retired adults. Overlooking Canada’s Golden Horseshoe region atop Hamilton Mountain, the retirement apartment building has operated at full capacity since the early 1980s. For several years, residents and their caregivers dreaded the thought of dealing with intermittent heating system shutdowns, often caused by leaky piping. When a new ownership group purchased the complex last year, they immediately saw the heating system problem as a major drain on operating budgets, so they gave HAMCO Heating and Cooling, of Hamilton, Ontario, the challenge of coming up with a sustainable solution. After a thorough assessment of aging heating equipment and leaking piping in the six-story building’s rooftop mechanical room, Jordan Vasilak, shop foreman and manager of installations at HAMCO, recommended a proven and reliable solution that would reinforce the retirement community’s “care-free” value proposition. “The new operating company of St. Elizabeth Villa is thrilled with the new Baxi high-efficiency commercial boilers and high-pressure and corrosion resistant aquatechnik PP-RCT 125 piping system we have installed,” Vasilak said. HAMCO replaced the building’s five low-efficiency atmospheric boilers (rated at 65 percent efficient) with a cascading system of five high efficiency Baxi Luna HT 1.100 modulating, condensing commercial boilers (98 percent thermal efficiency), which generate a total of up to 1,895,635 BTU/hr (rated heat input). The heating contractor also changed out corroding storage tanks with six 106(US)- gallon insulated Baxi dual-coil indirect storage tanks made of steel, coated with a double enameling on the inside surface. Since the boilers are staged in operation, the system provides significant efficiencies, plus built-in redundancy, ensuring continuous performance even when one of the boilers is being serviced. This reliability factor was not available with the previous system, so every time the old system went down it created an emergency situation for the apartment building community, according to Vasilak. HAMCO addressed problems associated with the leaks in the former system by changing out the failing metal piping in the mechanical room with aquatechnik PP-RCT fusion pipe and fittings, using ¾- to 4-inch diameter piping. While the piping is new to North America, with authorized regional distribution throughout the U.S. and Canada, aquatechnik has been a leading manufacturer of PP-R and now PP-RCT fusion piping solutions in Europe and other parts of the world since 1985. 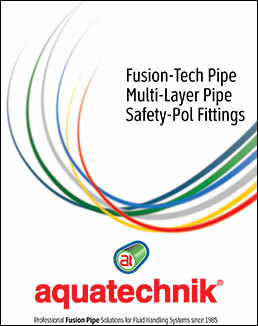 The aquatechnik piping system is NSF/ANSI 14, 61 and 372 certified for a wide range of fluid handling applications. Systems installed by trained aquatechnik contractors come with 30-year warranty and insurance protection. The mechanical contractor sees himself as a student of the heating and cooling business. He studied electrical and mechanical engineering in university, and has earned licenses in gas, electrical, sheet metal and refrigeration. The Vasilak family invests in continuous learning and certification for all 24 specialists employed by HAMCO, which now serves the broader Golden Horseshoe region of Ontario. To learn more, visit www.wallhungboilers.com and www.aquatechnikNA.com.